Come and taste the flight of Dierberg & Star Lane Wines! Dierberg focuses more on our cool climate Burgundian varietals while Star Lane focuses on their warm climate Bordeaux. You can also bring a picnic, get a bottle and enjoy our lovely views of Santa Rita Hills! 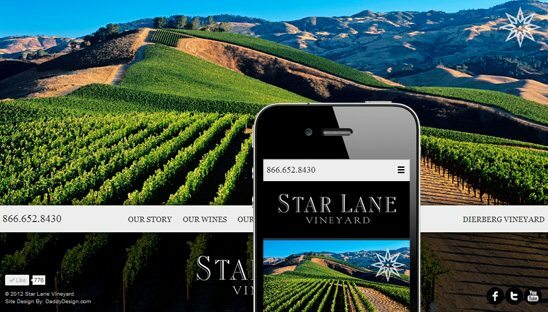 This project was for 2 separate WordPress wine sites. Both are responsive designs and both are using basically the same wordpress custom theme but with the colors altered. For the home page, we did a nice background slideshow with menu at bottom, for the inside pages the menu goes to the top and sub menu on the left. Each inside page has it’s own slideshow. Check out the sites on your computer, iPad and mobile phone!